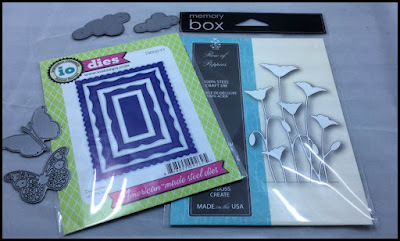 Berni here with another creation for the Dies R Us Inspiration blog! The California State flower is the Poppy. I have them on my patio. So I wanted to share. The Dies R Us on-line store carries a huge assortment of amazing dies by several manufacturers. What's interesting about this frame die from Impression Obsession, it is one die, but when you cut all (6) frames cut at the same time. I used the large outer and the next outer die to frame the memory box poppies. I wanted to reflect the color of the poppies, so I used a shimmer sheet. I cut the elizabeth craft butterfly on yellow cardstock and used some scrap bling paper for the back. I sponged the the clouds and give them a little lift with embossing dots. 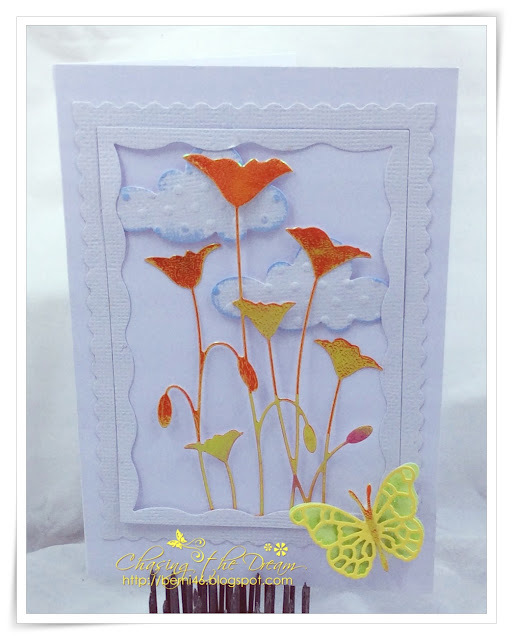 Gorgeous card, the poppies are beautifully coloured and look so delicate. Pretty, pretty poppies! Your card is perfectly designed! LOVE it! I love those flowers, such pretty colors, that frame is one my wish list :) just perfect for them and that sweet butterfly tops it off nicely!